In the mid-1970s, James Henderson decided to go globetrotting. The result was the rough, adventurous trek from Tangiers to Kenya recounted in this oversized book (8-1/2” x 11”), written in diary format. Henderson had barely finished his Master’s thesis when he packed a backpack, flew to Spain, and met up with his pal John. In Morocco, they joined a vehicle caravan of like-minded travelers. James received mail and sent out his exhilarating tales at stops along the way, and every night, curious locals, sometimes friendly, sometimes mildly hostile, surrounded the campers. In “King Kong,” an old bus they’d commandeered, they rolled south into the Congo. Soon Marion, whom James would later marry, joined the party. Foundering in thick mud, shucking engine parts, Kong presented almost daily challenges. Border crossings provided other anxious moments; some regions were especially volatile. Turned back from Amin’s Uganda, they stopped for a Christmas Eve celebration in Tanzania. In Nairobi, despite terrifying traffic, they relaxed and recouped lost mail. There, James sadly bid goodbye to Marion. Soon afterward, John headed to parts unknown; James and Marion reunited—and moved to Alaska. Henderson has apparently gathered old letters and diaries to recreate this emotive period in his youth. His writings are peppered with fresh, vivid observations and photographs. Admirably, he neither naively adulates the local culture, nor arrogantly dismisses it. Some writing issues contribute an unpolished feeling to the proceedings, suggesting the book was composed primarily for friends and family. Lengthy paragraphs (some more than a page long) and copyediting issues (most notably typos and missing commas) impede readability. Updates regarding current conditions in various countries and some wry wisdom based on hindsight would have given this book a wider reach. 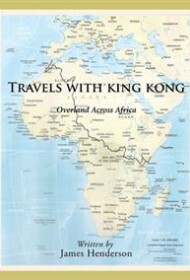 Nonetheless, with its memories of the free-wheeling lifestyle that was once possible, Travels with King Kong will attract those who trekked in that era (and those who wished they had), and could perhaps inspire a few hardy souls to wander.